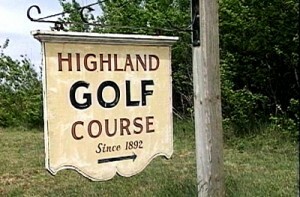 Highland LinksFounded in 1892, Highland Links Golf Course has celebrated over a century of golf. More significant than its age is Highland’s heritage. Deep natural rough, Scotch broom, heath, non irrigated open fairways, and spectacular ocean views keep the course a genuine links, as close to the Scottish tradition found anywhere in the eastern United States. The original Highland House Golf Links was adjunct to an ocean hotel and cottage resort operated for years by Isaac Small of Truro and his family, who promoted the course as “2000 yards around… in attractiveness not equaled in the New England coast.” Francis Ouimet, the legendary U.S. amateur golfer, played an exhibition round here after its original sand greens were converted to grass. First laid out by Willard Small, Isaac’s son, a redesign was implemented in 1913 by New Yorker and frequent hotel guest J. Henry McKinley. By 1955 the links had been refurbished again by owner Hal Conklin. In the 1960’s, when Congress approved President Kennedy’s Cape Cod National Seashore Act, Highland Links became Federal property and is currently leased to Johnson Golf Management.